If souls and bodies are different, why do we have bodies at all? Do perfect souls not have them? We can choose to be in either the spiritual or the material world. In each place we have a form, or body. In the spiritual world, body and soul are identical because everything is spirit. There the soul’s senses, intelligence, mind, ego, feelings, and desires are pure and transcendental and fully awakened in relation to Krishna. 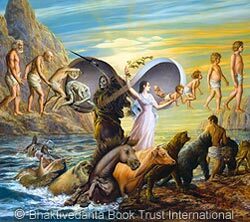 Spiritual bodies are eternal and full of knowledge and complete happiness. Free of the limitations of matter, simply by their will they can achieve, acquire, or do almost anything.